4.1 Does the ECAM22.110.SB Produce Cappuccino Automatically? 4.2 Which Delonghi Coffee Machine Should I Buy? The Delonghi Magnifica ECAM22.110.SB is a popular bean-to-cup machine with a range of coffee customisation options, Cappuccino System and stylish design. It’s also received strong reviews from buyers on shopping sites. But do the features of the ECAM22.110.SB justify its price tag? And how does the espresso actually taste? Let’s find out in our review! 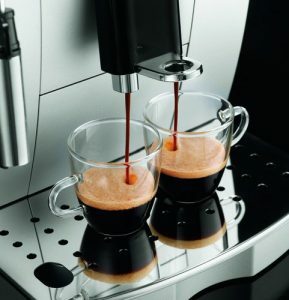 The ecam22.110sb machine has dual output for producing two espressos. With its silver exterior and coffee-shop style design, the Magnifica ECAM22.110.SB has a very different appearance to other Delonghi models (such as the Eletta or Esam 4000.b) which are often black and futuristic. 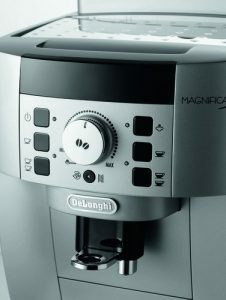 While we’ve praised the appearance of other Delonghi models, we’re also big fans of the Magnifica. It won’t look out of place in any kitchen. The control panel initially looks intimidating, but becomes self-explanatory after a few trial runs. The main dial allows you to decrease the intensity of the coffee, while the buttons surrounding it alter settings such as long or short coffee. To the left side of the machine is the Cappuccino System (which isn’t found on cheaper Delonghi models such as the Caffe Corso). This allows you to manually froth milk for cappuccino or lattes using the steam arm. While this is a useful feature, it’s not an automated system so it may take some practice to get the correct consistency. There are two dispensers for coffee, allowing you to make two cups from a single brewing cycle. The height of the dispensers can be adjusted depending on the size of your cups. Note: If you want an ECAM model with an automatic cappuccino system, check out our ECAM 23.460 review here. The control panel looks confusing but is actually simple to use. As you would expect from a bean-to-cup machine in this price range, there are a variety of settings for customising your coffee. Probably the most important is the dial for adjusting coffee strength, but you can also choose the aroma and whether you want a short, medium or long coffee. A great feature is the coffee temperature button. Not all bean-to-cup machines include this setting, but if you have a temperature preference it can make a big difference. Like most machines, the integrated grinder also has settings for coarseness (13 to be exact). 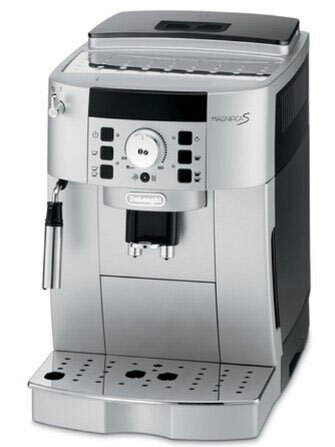 The Delonghi Magnifica ECAM22.110.SB produces excellent espresso with a strong aroma. While the taste is greatly affected by the quality of beans you use, the machine is capable of producing a balanced espresso with a rich crema. It also comes out piping hot on the highest temperature setting. The milk frother allows you to make drinks such as latte and cappuccino. While these can taste great, the milk frother needs to be used manually and requires some practice. 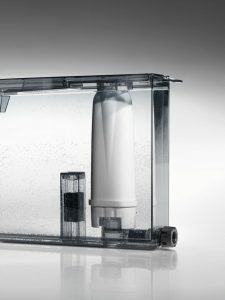 The water filter is great if you live in a hard water area. Like other Delonghi machines, the ECAM22.110.SB is designed to be easy to clean. While some manual cleaning and maintenance is required, especially the removable brewing unit, there are also automatic programmes for rinsing and decalcification. The machine will remind you when the decalcification programme needs to be run. This is usually every few months, but depends on how often you use the coffee maker. The 1.8 litre water reservoir can be removed for refilling and rinsing. It also includes a full indicator. The drip tray is easy to remove and empty when the full indicator is showing. Additionally, the machine self-rinses every time it turns on and off. This helps to keep it in top condition without any extra effort. The ECAM22.110.SB has a pre-brewing cycle to maximise flavour. A water filter is included to remove unwanted substances from the coffee. The model has energy saving features, such as automatic shutoff, and a standby mode. A programmable water hardness setting can be used to adjust the machine to the water conditions in your local area. Instructions are included for a water hardness test. The machine uses a new thermoblock (at the time of first production) to make coffee with a consistent temperature. Considering the range of features included with the Magnifica ECAM22.110.SB, we think it’s an excellent machine that provides great value for money. It’s cheaper than models such as the Jura ENA Micro 1, yet includes more settings and a Cappuccino system. If you love fresh coffee and want to have control over how it tastes, you’ll get a lot of value from the Magnifica. Reviewers praise the reliability of the machine, with some using it for several years without issue. Changing settings and customising your coffee is easy. Milk frothing can be tricky to get right initially, but once you’ve had some practice it’s possible to make excellent cappuccino. It’s a fast machine that goes from initial turn on to a cup of coffee relatively quickly. The transparent bean cover makes it easy to see when it needs to be topped up. While the Magnifica is simple to use once you’ve had some practice, reviewers mention that it’s vital to read the manual if you want to get the most out of it. The cup holder doesn’t get very warm so isn’t suitable for cup warming. Some reviewers find the milk frother difficult to use. Despite Delonghi’s claim of a “silent” grinder, grinding beans is still loud. This is unavoidable for bean-to-cup machines though. Does the ECAM22.110.SB Produce Cappuccino Automatically? No, there is no automated system for cappuccino. The Cappuccino System is a steam arm that allows you to froth milk manually before adding it to the espresso. This reduces the cost of the machine but can make it difficult to get professional-quality cappuccino and latte. Which Delonghi Coffee Machine Should I Buy? That’s not an easy question to answer, as it depends on your requirements. 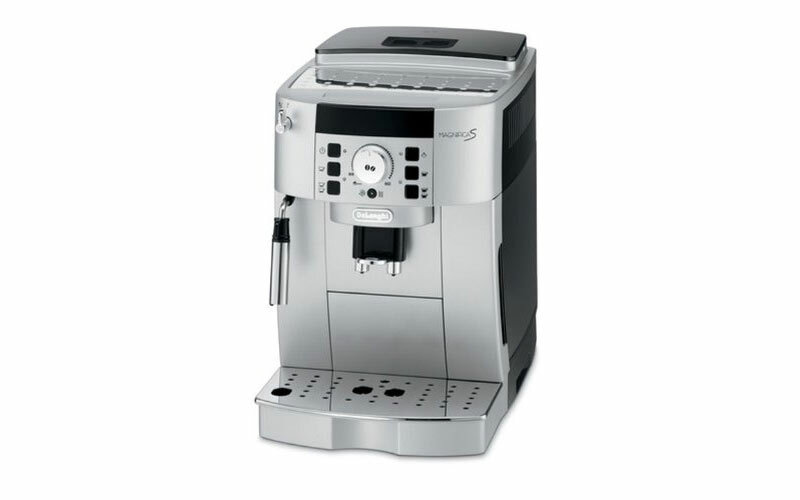 Check out our page of the best Delonghi models at the following link for more information: https://beantocupcoffee.co.uk/delonghi/. The Delonghi Magnifica ECAM22.110.SB is an excellent bean-to-cup machine if you don’t want to spend extra on an automatic cappuccino maker (for this see the Delonghi Eletta). It has a range of customisation settings, is easy to use and produces aromatic and balanced espresso. For these reasons, it’s an easy choice for our top 10 list. Click here to view its price. The Delonghi Magnifica ECAM22.110.SB is an excellent bean-to-cup coffee machine. With its range of coffee customisation settings, manual Cappuccino System and tasty espresso, it's one of the best models in its price range.